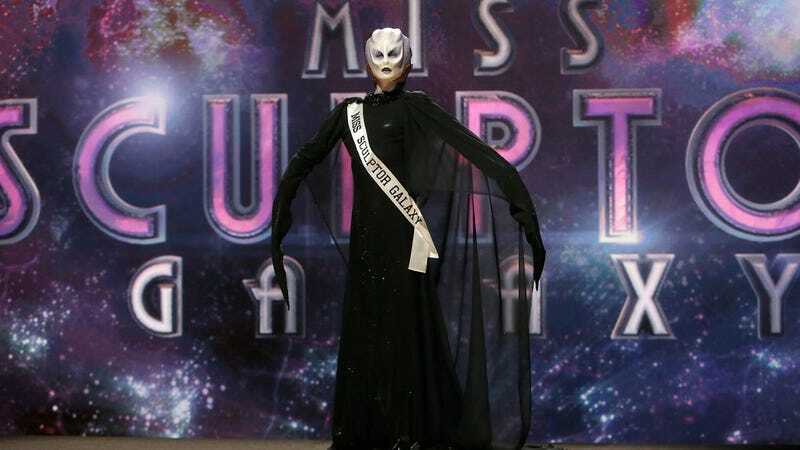 After last week's fashionable horror theme Face Off heads the other way this week with an alien beauty contest with an actual Miss Universe presenting the challenge. Which of the remaining eight contestants' creations will become Miss Intergalactic? Results ahead. This week's Foundation Challenge is a Holi Festival body painting contest. The three coaches - Laura, Anthony and Rayce - do a blind judging of the results. Stephanie bounces back from last week and wins immunity for this week's Spotlight Challenge. You can see how happy the other contestants are for her. The Spotlight Challenge is to create a Miss Intergalactic beauty contestant. The focus is on beauty, not everyone's strong suit, which is punctuated by having the 2013 Miss Universe, Gabriela Isler, introduce the challenge along with McKenzie. This week's guest judge is Darren Franich, senior writer at Entertainment Weekly. Adam and Julian make the top looks with their designs but Darla's elegant Miss Sculptor Galaxy wins the challenge. Darla's newly crowned Miss Intergalactic will also get a full page spread in Entertainment Weekly. Ben goes from last week's winner to bottom looks this week. He can't quite get the beauty part of the challenge down. But Kelly's Miss Sombrero Galaxy is a mess and she is sent home. This leaves coach Anthony with only one person left on his team - Ben. Rayce still has two and Laura (Go, Team Laura!) still has four.